Add a vintage style feel to your dining area with this rectangular counter height dining room table set. 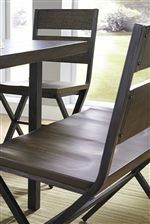 Each piece is composed of pine veneers and hardwood solids, finished with a medium brown reclaimed look. The table's base features metal squared legs with a detailed stretcher, next the metal has been finished with a metallic brush effect and nail head detailing for a vintage impression. Gather around and enjoy a meal at this beautifully distressed table. 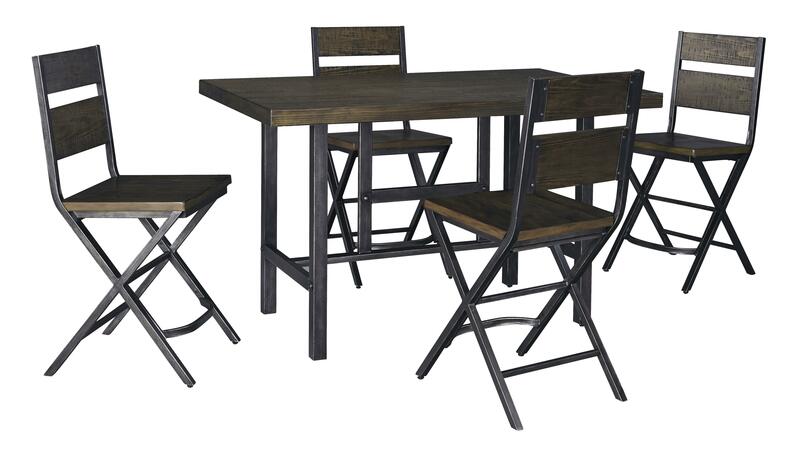 This set is perfect for dinner guests young or old, the stools have contoured seats with your comfort in mind. 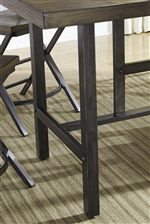 Boasting a functional crisscross leg design, which is finished in a metallic brushed effect. The Kavara 5 Pc Dining Group by Signature Design by Ashley at Royal Furniture in the Memphis, Nashville, Jackson, Birmingham area. Product availability may vary. Contact us for the most current availability on this product. The Kavara collection is a great option if you are looking for Relaxed Vintage furniture in the Memphis, Nashville, Jackson, Birmingham area. Browse other items in the Kavara collection from Royal Furniture in the Memphis, Nashville, Jackson, Birmingham area.